The Famous Artist's School supplies books, e-books and multimedia courses to choose from. Each product provides a slightly different learning experience, depending on what you are looking for. The Famous Artists School is comparable to Learn and Master Painting and the Virtual Art Academy in that they offer a comprehensive multimedia package including assignments. The Famous Artists School is set up for the serious amateur in mind, offering two modes of study. The Certificate course (makes up the first half of the Masters course), comprises ten lessons and can be purchased on its own. After completing this, students can progress to the Masters course which is another 24 lessons. A more cost effective way of purchasing the whole course is available, if you are sure this is what you want to do, and there are also instalment options for spreading the cost. Please note that these titles are not university qualifications and do not carry university credits. The Famous Artists School offers courses in Illustration and Design, Oil and Watercolor Painting, a shorter Discovery course and a course for Young People. The Discovery course is a more concise version drawing on modules from the Certificate and Masters courses. It is designed to give you a taster into the media of painting and drawing. The Illustration and Design courses cover drawing and painting techniques, use of color, composition, creating texture and patterns, and Vital Force. The advanced vocational modules offered in the Masters course are Figure Illustration and Design, and Art Direction. The course in Painting covers oil and watercolor painting, color and composition, landscape and still life, with vocational Masters module options in survey, landscape and portraiture. Online resources include an e-Magazine, useful links, materials and supplies and a contact for further information by e-mail or telephone. Course assignments are sent by you to your course tutor, who will make notes, suggest improvements and make changes to your work by using tissue paper or a clear acetate sheet, which will be sent back to you with your work. You will also receive a thorough written letter about your assignment from the tutor. Your work will be photographed using a digital camera and the pictures will be stored for future reference to help monitor your progress. All of this can be copied onto CD and given to you at the end of your course on request. The individual tuition and high quality accompanying course materials are reflected in the price, which is higher than the other multimedia courses. This may account for this course being lower down in the category listing, because it is less of an off-the-shelf purchase and so may sell fewer numbers. There is a 15-day trial offer which is recommended for an investment of this kind. After all it is not only your money but also your time which you will be putting down. 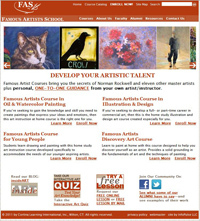 On Famous-Artists-School.com you'll find a sample lesson which gives you a good idea of the style and approach of this course. High emphasis is placed on technical detail such as tone, color, composition, perspective and the expression of movement and emotion. These are skills that can be learned but also give you a good grounding for developing your own style and creativity. With this technical grounding, using examples of famous painters' work as a basis for study, the student will come away with a better understanding for what makes a good painting, rather than the popular "learning by numbers" style of approach. This course provides a good grounding for the serious amateur with a balance of technique and creativity needed to approach the medium of painting and drawing. The purpose of these courses is to help people to take the first step towards a career as a working artist.